Ben Tran wearing one of his classic polo shirts. I have always been interested in fashion as a type of wearable art. I believe there is so much room for creativity every day when a person decides how to decorate their body. At an early age I became involved with sewing and thus formed my fascination with textiles and personal style. Since then I’ve been intrigued by the many different ways that people represent themselves through the way they dress themselves. I write this column in hopes of highlighting Lawrentians with unique senses of style and diving deeper into the philosophies behind manufactured appearances. Junior math and studio art major Ben Tran has a passion for studying body image. Fashion is a way that Ben connects with himself and the world. People perceive Ben as having a certain style, but he sees it more as a form of communication than as an identity forming behavior. Tran’s dream job would be to work as a fashion illustrator or editor-in-chief for a fashion company. Over winter break he had a job in New York working with a fashion firm. He is learning to actualize this goal by expanding his portfolio, advancing his skills in Photoshop and evolving his illustration techniques. Until he reached high school, Tran was required to wear a school uniform. His uniform called for Polo shirts and although he got fed up with it then, he would love to see a revival of these stylish collared button ups. To Ben, people that wore Polo regularly looked fun, especially if they wore different colors. Looking back on the days of uniforms, Ben has learned to appreciate the era because his culture was more collective. Something that sets Tran’s sense of style apart from others is his taste for antique and vintage elements. Tran gravitates towards vintage and recycled clothing—pieces that have already been lived in and filled with personality. 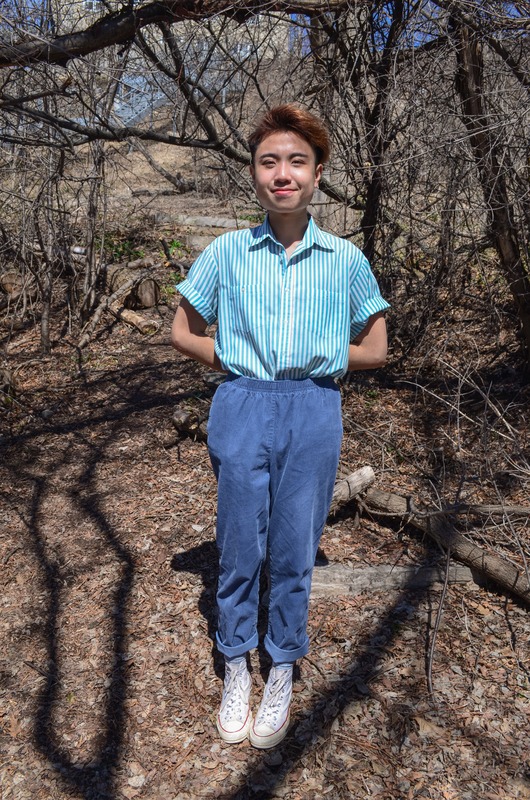 Other than vintage stores and thrift shopping, Tran has found some more niche outlets to collect clothes for his wardrobe. Online platforms like Etsy, Depop and Asos Marketplace cater more towards savvy shoppers like Ben than any department store ever could. Here, sellers can list clothes that they found, created or just can’t hold onto anymore. This guarantees that these pieces already have some character to them, making them unique in ways that freshly mass-produced clothes can’t achieve. Shopping vintage and secondhand also tends to be supportive of local fashion. Tran sees fashion as a way that one can connect to their personality and, when shopping second-hand, a way to connect to other people’s personalities. Some clothing styles function as historical markers. They can represent specific moments in time and are almost never without context, like the bellbottoms of the 1970s or the Juicy brand tracksuits of the early 2000s. Ben’s interest in second-hand vintage clothing started as a child. He didn’t enjoy when his parents would buy him brand-new clothing. Instead, Ben would want the clothes that had been sitting lifeless in his grandpa’s or father’s closet. One particular piece he was gifted was a long Polo shirt from his grandpa that Tran wore with one of his mom’s belts as a dress. Since then, Tran started exploring his feminine side through clothing. “I know I looked ridiculous back then, but now I just feel like it was gradually helping me express myself,” he said. The process of learning to wear more feminine-styled clothes was intense for him, but worth it. “Sometimes people say that I have this certain style, but I feel like its just me communicating,” stated Tran. This idea is illustrated through Tran’s purposeful manipulation of his clothing. He makes sure each piece of his clothing he wears is tailored to a shape and size of his liking. This also strengthens his identity as an individual, because the cuts Tran makes on his clothing are all unique and advance the item into something new and special to his wardrobe.